Photos and commentary provided by a Greater City Providence reader. Is this the building in question? Build to suit, demo to suit… whatevs. Demo? But it isn’t a Friday of a holiday weekend. I know, they really shoulda done this Monday, amateurs. I remember when EBN had a studio there. Just like the Ethan Allen building on north main I find it hard to mourn the loss of 70s industrial utilitarian architecture. Agreed, except the single story Ethan Allen Building is built to the street-line on three streets North Main, Frost, and Nashua Streets, which is far better from a pedestrian or an urban design standpoint. So if the Ethan Allen facade happens to be dated or tacky, it would be fairly easy to make inexpensive facade modifications to improve and reuse the building. In the case of the Plainfield-Dyke-Atwood block, the generic C2 and M1 zoning, for the front and the back of the block respectively, doesn’t require any special street-wall or use requirements. The most likely results of new construction would be a single-story suburban strip retail building setback from the street surrounded by parking on three or four sides. 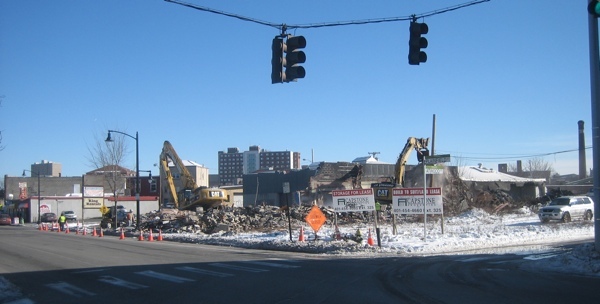 Whether it’s a parking lot or a strip retail building, how would that improve the city as compared to the existing “industrial utilitarian architecture” that has just been demolished on the Plainfield-Dyke-Atwood block? I am just saying not all demolition is equal. 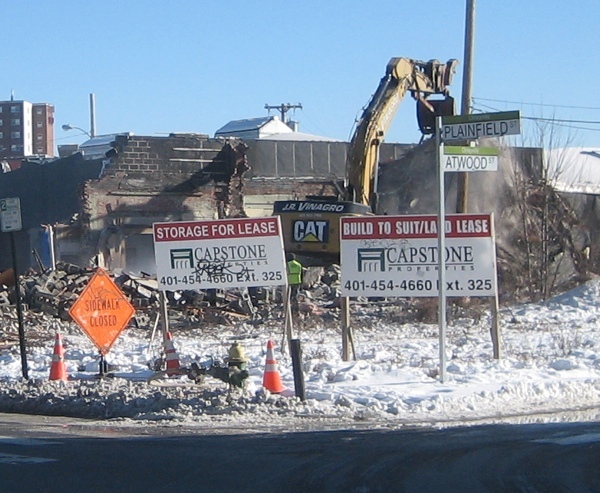 Fussing about buildings that don’t contribute to the fabric of the city being demoed makes us less credible when we face the destruction of buildings that contribute more positively and have more inherent community and historic value. It is right fret about what will go in its place (if anything). That strikes me as more to do with the business climate, tax, and zoning regulations than anything inherent to the creation of open space. I cannot speak much about the building on plainfield other than the pictures on the web. Though based on them I am not sure how it contributes to the historic nature of the area. The Ethan Allen building was at a point that the empty lot is less of a detriment to the neighborhood than the building with its decaying giant blank walls. It does not matter if the modifications are “inexpensive” if they generate no value for the owner. I am guessing it was not worth improving the building in the manner you are suggesting given the number of similar buildings up and down that street that are in better shape and empty. Perhaps, I should have used the word modest rather than inexpensive. 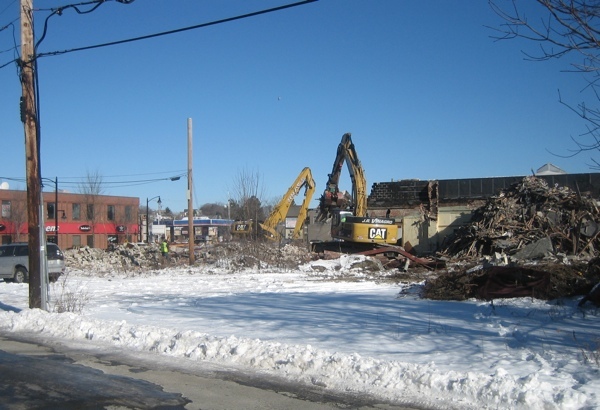 Because of the current economy, the Plainfield property owner probably couldn’t find a tenant(s) for the connecting group of buildings that were demolished. My point was to address this over accepted notion in Providence that buildings (I would also add streets) are disposable if they don’t fit a narrow definition of historic or significant. There are hundreds of vacant commercial and industrial properties in the city, some historic some not. Most of these vacancies are in less affluent sections or along major arterial streets. Immediately adjacent to the Plainfield block is a hand full of 1- to 4-story listed historic mill buildings that are also vacant. If the existing urban context is eliminated, then it becomes much easier for everything to be potentially disposable because the urban fabric is shredded. 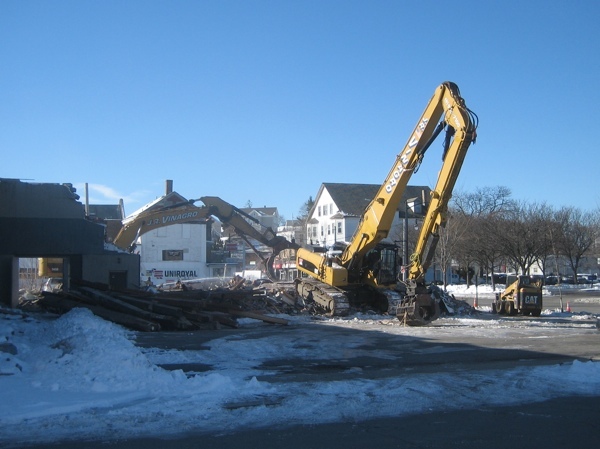 A block away in Olneyville Square itself, mostly on the north side, has been severely fragmented over time by building demolitions replaced by parking lots or new-ish buildings that have been built setback from the street to accommodate cars rather than people. By the way, if the 230-foot wide Plainfield block were consolidated, there would be plenty of room for a conventional suburban McDonald’s with parking all the way around and a drive-thru. 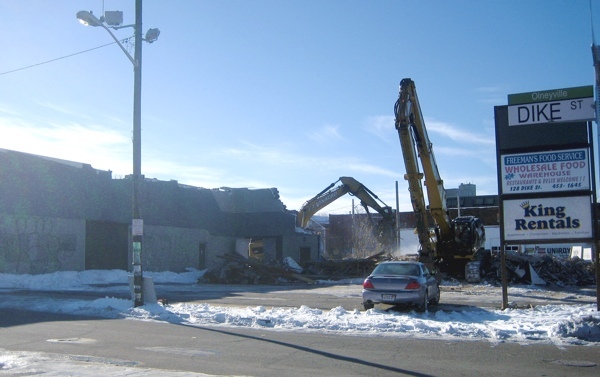 For existing buildings business climate and real estate taxes affect the decisions of property owners the most, as to whether a building is preserved or demolished. This discussion should really be about zoning regulations as are the key to what can or can’t be rebuilt. Even if the rules say a 3-story building is permitted, at present whether it’s Plainfield or North Main, there’s no incentive to build anything other than a parking lot or single-story strip retail building in the middle of the lot. That’s the very building from your initial Gmaps link. They’d just begun demo when I was on the 19 bus toward work, and that window was still intact. By the ride home after work, there was nothing but rubble.